The Saints have a distinct process and admirably put that before any high-profile gun-for-hire. IT WAS January 2015 when Les Reed, Southampton’s executive director of football, gave an incredibly insightful interview to Gary Neville. The former Manchester United defender had taken part-control of Salford City and was keen to learn more about management structure. As simplistic as it sounded, Reed extolled the virtues of being prepared. “We have a whole department for the recruitment of players, but it struck me some years ago that when a manager leaves, that’s when the club reacts and starts looking for a new one”, he told Neville. There were more than a few raised eyebrows when the Saints sacked Nigel Adkins after he guided the club to successive promotions and returned them to the top-flight for the first time in seven years. They weren’t doing badly. They were in 15th and had just came back from 2-0 down to draw with Chelsea at Stamford Bridge two days previously. But Reed and his cohorts believed that Adkins had got them to a respectable level and it was the right time to want more. They had pinpointed the man they felt would push them on too. While scouting Philippe Coutinho, who was on loan at Espanyol in early 2012, they began to appreciate the style and system deployed by the club’s coach: Mauricio Pochettino. “They played from the back with the ball on the floor”, said Reed years later. Under Pochettino, Southampton rose to the cusp of the top-six. When Tottenham took him to north London, and when a litany of competitors pilfered the best of the Southampton squad, many expected the inevitable crash. But instead, they were prepared. And Reed consulted with his trusty shortlist yet again to bring in Ronald Koeman. “My job is to identify coaches who will buy into it [the club model] because of the track record they’ve got and the style they play”, he told Neville. We look for evidence that they’ve brought young players through before. We think we’ve done a lot of work and we continue to try and stay ahead of the game, so what we provide for a manager is everything he could possibly want. [Some clubs] go for a personality or a track record and the manager says – ‘If I come to you, if you’re lucky enough to have me, I want this, this, this and this.’ We would never go down that route. We will not be interviewed by a manager – we will interview them”. What’s clear is that over the last four years, the club has built a desirable model that they have no intention of moving away from. That’s why they care little for chasing expensive, marquee managers. They want to attract coaches with principles and an approach that dovetails with what they’ve been nurturing. 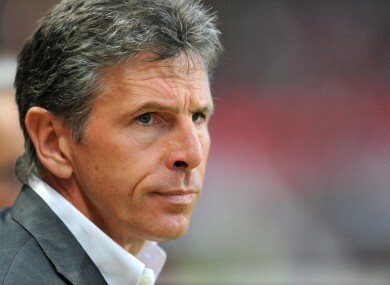 The club’s latest appointment – Claude Puel – is another example of Southampton’s meticulous and careful managerial recruitment. He has not worked outside of France before, spending his entire playing career at Monaco – the bulk of it under Arsene Wenger, his mentor – before managing the side and winning a French championship in his first season in charge. Since 2002, he’s been at a variety of teams but won nothing. He got Lyon to the final four of the Champions League for the first time in their history in 2010 but not much else. But scratch beneath the surface and a more revealing picture emerges. At Lyon, he oversaw the development of Hugo Lloris, Miralem Pjanic, Aly Cissokho and Karim Benzema though it’s easy to point the finger at him for ending a run of seven straight league titles. At Nice, where he’d been since 2012, Puel had the youngest squad in the league and got them playing, arguably, the best football in the league. He also converted Hatem Ben Arfa from a Hull City reserve to all-conquering hero – the mercurial winger rediscovering his golden touch while under Puel’s tutelage with 17 goals from 32 league games. Back in 2013, Nice’s objective was to stay in the top-flight. Two years later, they were three points short of a runners-up spot and booking their place in Europe. Puel puts style before results and that’s certainly admirable. He’s in the right place at Southampton, who won’t be exposing their players to a brand-new style of football. The hope is that – just like with Koeman’s appointment – a new face will change very little. The club will immediately have to deal with the loss of two more high-profile players in Victor Wanyama and Sadio Mane. But Koeman handled the exits of Lallana, Lovren, Shaw, Lambert and Chambers superbly – and went on to deliver an astoundingly consistent debut term in office. We will hear plenty of references to Remi Garde over the the next few days and weeks. Another Wenger disciple, his spell at Aston Villa lasted for 147 days and the club were relegated at the end of the season. But that says more about the environment he walked into than anything else. At least Puel can count on an encouraging one at Southampton. Email “Southampton's careful and meticulous manager search shows up other teams' bumbling ”. Feedback on “Southampton's careful and meticulous manager search shows up other teams' bumbling ”.